Installation how to - The download page contains an installation how to. We recomend it to be read first to make sure everything is set correctly. Tutorial - Short tutorial on this page will introduce you to touchqode editor. FAQ - Other questions you may ask are answered in the faq section. How to keep your source code synchronized with touchqode? How to set up my synchronization step by step? You suggest downloading new version of file every time you edit it. Isn't that a waste of bandwidth? I try to run / compile my code, but the application says "Could not find SL4A interpreter"! How to copy and paste more efficiently? Keyboard is missing at, pipe, hash keys (@, |, #)? How to quickly switch between recent files? Keyboard does not show up! How to navigate in file? I have three buttons "a", "b", "c" on the screen. What happened? Will touchqode fit my way of thinking? I am left handed or I do not like buttons on left side. What to do? I have been working on my file for half an hour and now it is gone. How do I recover lost file? I have a bug in my source and want to fix it on my way home - what is the best approach? Are you affiliated with dropbox? I really like touchqode. How can I contribute? Your software is full of bugs! Touchqode can compile and run some of your code using SL4A, more here. Disclaimer: this section might sound a bit complicated. The reason is we are in the early stage of development and are focusing on the components that adds most value to the code editor itself. For time being the synchronization is handled well by dropbox (even though setup is not entirely simple). We plan to simplify synchronization in future releases. If you just want to see step-by-step tutorial see next question. You get biggest advantage from using touchqode when you can continue to work on the same version of sources as you have on your desktop. To do this you can use any synchronization service since touchqode associates itself as editor of text files on android. However we are personally using dropbox service to keep our source files always available from the internet and we are quite happy with it. On the desktop you have to set up a dropbox shared folder. However you probably want to have control over which files get synchronized back to the project folder. Because of that do NOT share the working project folders with dropbox. Instead we suggest to use rsync or equivalent to echo changes from project folder to dropbox folder. Rsync comes bundled with Linux and MacOSX; on windows we use cwRsync which can be found here After receiving changes from mobile phone use windiff to check the new changes before copying them to the project folder. This helps to keep peace of mind that dropbox will not accidentially overwrite some of your work. On linux diff should do the same job. On Mac OS X you could use FileMerge (it should come with Xcode). For a detailed setup instructions see next question. If you want to work on your latest version from mobile phone you need to have dropbox android app installed. To ensure that you work on fresh files always first run the dropbox app. In the app navigate to the file you want to edit and tap on it – dropbox downloads it and offers you choice of text editors. Choose touchqode and you are ready to view and edit the file. Every time you save file it gets uploaded by dropbox to server. However once you have synchronized all necessary files you can use touchqode quick switching to move between files. Register with dropbox, install its desktop application. (optional)Create a desktop shortcut for running rsync batch file. Create a batch file that diffs your dropbox and desktop project folders. (optional)Create a desktop shortcut for running windiff batch file. Now you can synchronize and diff files between your project and dropbox folder by one click from your desktop. 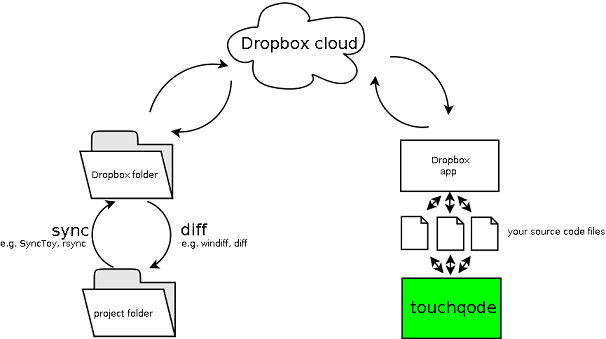 When you save file from touchqode it will be automatically uploaded back to Dropbox. Somewhat yes. However most source files are probably not much larger than 50-100kb which is smaller than amount of data you download for single web page. Plus they are easy to compress so they shouldn't impact your bills significantly. android.permission.INTERNET - access to the internet is needed for providing access to feedback form on the web. Touchqode also uses Google Analytics for Mobile to count the usage (you can turn off analytics in settings). android.permission.WRITE_EXTERNAL_STORAGE - touchqode comes with sample files for you to try out editing. They are copied to /sdcard/touchqode/samples on first install. Directory /sdcard/touchqode is also used for autosave files and other internal touchqode storage. android.permission.ACCESS_NETWORK_STATE - permission is required by Google Analytics for Mobile (similar as INTERNET permission). Press ALT+Tab to switch to symbol keyboard and you can find them there. Press <Recent files> button and choose one of the 15 recently opened files. Press <Edit> button and it should show up. Touchqode works in two basic modes – view and edit. In view mode you move around your file and search. In edit mode you actually edit your file. The keyboard is not shown automatically (this is intentional) – it shows only when you press <Edit> button i.e. you enter edit mode. Press <Search> button or search hardware button on your phone – the search pane will be shown. As you type the incremental search will go to next found occurrence. If you want to see next occurrence press <Next> button. For all occurrences press <All> button. If you want to start another search press <Clear> button. All occurrences are shown in the thin black column on the right. You can use it to navigate easily across multiple found results – just tap on the small purple rectangle corresponding to it. I have three buttons: "a", "b", "c" on the screen. What happened? You have probably pressed ALT+Space or Tab and you were shown autocomplete pane with suggestions based on your position. In order to minimize number of suggested words we present you only with their longest common prefixes. E.g. for possible suggested words "public", "private" and "protected" we show only "public" and "pr". When you click on "pr" you will get suggestions "protected" and "private". In your particular case you probably pressed ALT+Tab on blank line so touchqode offered you all possible keywords sorted by their longest common prefixes - which happen to be "a", "b" and "c". To see other suggestions you can scroll the list of buttons. Touchqode was created from personal need and we are using it on regular basis if only to browse through the code we have been working on the way home. It was conceived as somewhat a cross between vim with its normal, insert and visual modes and eclipse with great code navigation and autocomplete tools. <Toggle buttons> button is in the menu. It toggles between three states of the buttons - left, right and invisible. It should not be gone for good - touchqode has autosave feature - every two minutes it saves current file to path /sdcard/touchqode/autosave.tmp so check there. Use mobile source code editor - touchqode! For instructions how to set up everything see tutorial. No, we are not connected to them in any way. But we like their service and are using it ourselves. We are happy you like it! Spread the word, let people know, blog about it, send us bug reports and feedback. If you want to contribute money - touchqode is currently free but we welcome donations using paypal. And in case you are really good programmer and would like to work with us let us know. We are sorry. Since touchqode is in alpha version we know there are issues. We are hunting for and fixing each single bug we can track down but we are always eager to fix bugs we get to know from our users. Please file a bug report in contact section. Following instructions might help in using this functionality. First, you will need to install the SL4A installed from SL4A homepage to your Android. In the middle of this page there is a big QR code. Download this apk (sl4a_r3.apk) and install it. You can do this right from your phone, or via USB from your computer (Mind the sizes downloads!). This way you get the basic environment, but you do not have any language installed yet. In the right section of this page on top ("Featured" / "Downloads"), there are several links to .apk files. Choose the languages of your choice, install them. You can find more languages (PHP, JRuby..) in "External links" section on the right. After that you are ready to run your first script on Android. Watch out for the size of the downloaded files!! They can be more than 10MB per language and during the installation, the apk can download even more MBs! We recommend that you do this installation via a free wifi!! After you have your favourite languages in SL4A in your phone, run the code by clicking Menu/Save & Run.